Windows XP Service Pack 2 (SP2) was released on August 6th 2004 and it is the largest update to Windows XP since the original release of Windows XP. SP2 is not immediately available (at this time: August 2004) for download from www.windowsupdate.com therefore users will have to download and install the “full” (also called the “Network Install”) of Windows XP Service Pack 2. This link is for the English version. The file size is approximately 266 MB. Slipstreaming is the term used to describe the integration of a service pack with the installation files from the original installation media. In this example, Windows XP Service Pack 2 will be integrated with the original files from Windows XP Home Edition. 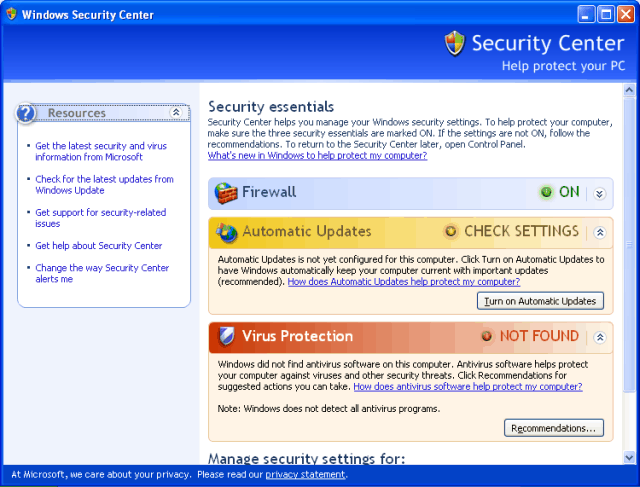 Windows XP Service Pack 2 installs a brand new “Security Center” for users to protect their computers against a variety of security risks. This page provides information about some of the basic technical specifications and standards in use in Trinidad and Tobago. Will you be visiting Trinidad and Tobago in the near future? Will you be bringing your electronic devices (e.g. digital camera, cellphone, PDA, laptop computer, MP3 player, etc) with you? This page is for you. at a frequency of 60 Hertz (60Hz). the typical residential supply is AC, 115/230 Volt, single phase, 3 wire. For most purposes, the electrical outlets available to the typical visitor (at hotels, guest houses, homes of relatives/friends, etc) will supply 115V/60Hz electricity. The electrical voltage can vary in the range 110V to 120V depending on time of day, load conditions, demand, etc. Your electrical device should be able to operate in the 110V to 120V range. Telephone outlets use the RJ-11 socket. Phones, fax machines, answering machines, modems, etc. are connected to the outlet via a RJ-11 modular plug. The local phone company, Telecommunications Services of Trinidad and Tobago, (TSTT) offers both TDMA and GSM cellular service. Reminder: Check with your cellular service provider for information about roaming rates, compatibility, etc.) before bringing your cellular phone to Trinidad and Tobago. Further information about the GSM service can be found on our GSM in TnT page. Trinidad and Tobago uses the North American standard for television broadcasting. NTSC to PAL and PAL to NTSC conversions are available from local video production companies (check the local telephone directory for contact information) but can be expensive for the average visitor. The access can be directly from your room via a Ethernet cable or WiFi. It may also be from a specially designated “computer room” where you can plug your portable computer into a telephone jack or ethernet port. There are many cybercafes locate throughout the country, check the local telephone directory for contact information. Quality of service, speed and available equipment/applications varies from cafe to cafe. One local ISP, Opus Networx offers a “visitor account” for the duration of your stay. Check the website: http://www.opusnetworx.co.tt for further details. The local phone company (TSTT) offers Internet access service without the need to sign-up for an account. Simply configure your computer to dial 619-easy (3279) and use the username EASY (use all capital letters because it is case-sensitive). There is no password. The call will cost TT 75 cents per minute (VAT inclusive) and will be billed to the phone number from which the call was made. e.g. if you make the call from telephone number 611-0001 and spend 10 minutes online, then the charge of (0.75 x 10) TT$7.50 for Internet access time will be added to the bill for phone number 611-0001. Please do not abuse the facility and leave your relatives or friends with large phone bills for Internet access time. There are no “freenet”-style 80211.b, 80211.g or other such public access wireless (“WiFi”) networks currently in operation (July 2004). Hardware for PC desktop systems e.g. RAM modules, motherboards, keyboards, mice, network cards, hard drives, floppy drives, video cards, cases, cables, etc are available “off-the-shelf” from local retailers. Hardware for Macs is not so common. However, modern desktop Macs do use some components that are common to both Macs and PCs so, to a certain, limited extent, hardware is available. Internal hardware for laptops (PCs and Macs) is rare. These machines use proprietary form factor parts which will not be available “off-the-shelf”. Reminder: If you are traveling with your various electronic devices (e.g. laptop computer, PDA, digital camera, MP3 player, etc) bring: your AC adapter, spare batteries and your battery charger if possible/where applicable. Length: millimetres, centimetres, metres, kilometres. Speed: kilometres per hour (Km/h). However, as a former british colony, it is not uncommon for citizens to refer to these measurements in their imperial formats, e.g. “pounds”, “miles”, “feet”, “inches”, etc. Note: the Metric system should be used for all business transactions. Carbon and alkaline batteries are commonly available in the following formats: AAA, AA, C, D.
“Button” batteries, such as those used in watches and calculators are available. Rechargable batteries and those with exotic contents e.g. lithium are less common. If your electronic equipment (e.g. laptop, digital camera, MP3 player, PDA) uses a battery with a proprietary form factor, it is unlikely you will be able to purchase a replacement “off-the-shelf”. Reminder: travel with spare batteries and your battery charger if possible/where applicable. Compact cassettes (As of 2013, this is no longer considered a common medium). CD-R(ecordable): 650MB and 700MB are common. CD-R specifically for audio is also available (but more expensive than “data” CD-Rs). Recordable 4.7GB DVDs are available. Formats include: DVD-R, DVD-RW, DVD+R, DVD+RW. The AM band uses 540 Khz to 1600Khz. The FM band uses 88Mhz to 108Mhz. There are two AM stations: 610 (state owned/operated) and 730 (privately owned/operated). 97, 98.1, 100, 101, 102, 103, 104, 105, 106. Programming content includes: news, community announcements, local music, caribbean music, east-indian music, foreign pop music, hip-hop, talk radio, religious music and talk, easy listening and “golden-oldies”. CCN-TV6: privately owned/operated. VHF Channel 6 (in Trinidad), UHF channel 18 (some parts of northern Trinindad and all of Tobago), UHF channel 19 (only in Tobago). Gayelle TV: privately owned/operated. UHF Channel 23. This is a “community” channel located in north western Trinidad. Other parts of the Trinidad and and all of Tobago may not receive this broadcast signal. These stations operate “over the air” on standard VHF and UHF broadcast frequencies. They are also available (unscrambled) on the local cable television system (CCTT) in Trinidad: TTT can be found on channel 3, TIC can be found on channel 4, TV6 can be found on channel 5, Gayelle on channel 7. We can only answer questions involving Trinidad and Tobago. Do not email us with questions about other countries. We may not be able to answer your question(s). Information on this page is subject to change without further notice. We may not reply if your question has already been answered by material provided on this page. This page is for information purposes only. It is not an endorsement of the services provided by any entity linked to or mentioned on this page. You are solely responsible for any and all: financial loss, damage to your equipment or loss of data that may result directly or indirectly from the use of information contained on this page. Data transfer rates of up to 400 Mbps. “Hot plug” connectivity (equipment using the interface can be connected and disconnected while the computer is powered on). A maximum cable length of 4.5 metres. 1394a:Was finalised/adopted in 2000. It provided specifications for enhanced performance and power management on the FireWire bus. This page is about the GSM cellular telephone service offered by TSTT to citizens of Trinidad and Tobago. GSM is the: Global System for Mobile Communications. It is a next generation telecommunications service that offers capabilities beyond the traditional voice and text of exisiting cellular services. TSTT is marketing the service under the brand name: “mpower”. Note: the Trinidad and Tobago Computer Society (TTCS) is unable to answer questions about services in other countries. What are the features of GSM? Per second billing (TSTT will not round the call time up to the nearest minute). Voice Mail (a fee will be applied for playing-back recorded messages while roaming). “Call barring of incoming calls while roaming” (block incoming calls while roaming). Ability to roam, that is, use GSM networks outside of Trinidad and Tobago. See this section of the FAQ (Frequently Asked Questions) section for more information about roaming. The original GSM specification has a data transfer rate of 9.6K. Technologies such as GPRS (general packet radio service) have increased those transfer rates to allow users to browse the Internet, send/receive e-mail. In the near future, users will also be able to take advantage of multimedia services such as streaming audio and video. Data Services, including Internet access, are currently under trial and have not been officially launched at this time (early July 2004). The Services should be launched towards the end of July 2004. Further information about data services can be found at this link. Where can I roam with my TSTT-based GSM phone? The GSM frequencies supported by your phone. The TSTT system uses 1800MHz (1.8GHz). If you travel frequently to different areas of the globe then a tri-band phone would be a better investment. See the FAQ (Frequently Asked Questions) section for more information about tri-band phones. Whether or not TSTT has a roaming agreement with the network operator that provides GSM service in the area where you wish to roam. The roaming agreement provides for user authentication, billing procedures and service charges. See the FAQ (Frequently Asked Questions) section for more information about roaming. Reminder: roaming with a cellular phone (either TDMA or GSM) is expensive. This table is based on TSTT advertisments in the Guardian newspaper (Monday 13 October 2003, pages 36 and 37) and (Thursday 12 February 2004, page 79). 1 ALL calls terminated on the TNL Brazil network are charged a one time charge of US$0.54. 2 ALL calls terminated on the ESPRT-Amena network are charged a set-up charge of US$0.17. Rates are in US dollars and DO NOT include value added tax (VAT)and other taxes/tolls. Rates are subject to change without further notice. Charges apply to ALL calls made and received on the handset. Prices/rates valid as of 09 February 2004. Prices represent the per minute rate. Toll and other charges are applied to all international calls made while roaming. Toll charges are similar to those printed in the TSTT telephone directory. Additional taxes maybe applied by the individual carriers. TSTT’s GSM network operates on the 1800MHz (1.8GHz) frequency. Note to visitors from (USA/Canada/Europe/Asia/”foreign”): If your “home network” is based in one of these countries/with one of these cellular/network operators, then you may have “seamless” GSM roaming facilities in Trinidad and Tobago. As always, contact the cellular/network operator who currently provides you with GSM services for further information. Information in this section is based on a TSTT advertisment in the Guardian newspaper (Tuesday 22 June 2004, page 40). Prices are valid/effective as of Thursday 3rd June 2004. Prices DO NOT include tolls and taxes. Customers of these carriers will be able to use the same features when they roam in Trinidad and Tobago. Information in this section is based on a TSTT advertisment in the Guardian newspaper (Wednesday 02 June 2004, page 6). Airtime: US 22 cents per minute. SMS text: US 35 cents per message. Receiving is free. These prices are applicable as of 29 April 2004. Additional taxes and tolls may be added to the base price depending on location. TSTT customers roaming on other cellular networks will be billed according to this table. These rates apply to both TDMA and GSM customers. Information in this section is based on a TSTT advertisment in Newsday (Tuesday 29 June 2004, page 24). TSTT has reduced the rates on international calls by fifty percent (50%) effective 29 June 2004. This rate reduction is applicable to mobile users and means that the discount offered on the 10-10-335 service will no longer be available. Callers to these countries will receive a forty percent (40%) discount after the first four (4) minutes. What are the rates for post-paid GSM service? This table is based on a TSTT advertisment in the Guardian newspaper (Saturday 29 March 2003, pages 40 and 41). All prices are in TT dollars and are VAT inclusive. These rates apply only to calls made on the TSTT network (i.e. within Trinidad and Tobago). Rates for a TSTT customer roaming abroad can be found here. call barring (block incoming calls while roaming) and voice mail, roll-over minutes, 12 cents per minute on Sundays, per second billing. Data services will incur separate, additional service charges. A fee will be applied for playing-back recorded messages (voice mail messages) while roaming. Note to visitors from (USA/Canada/Europe/Asia/”foreign”): These rates are for TSTT customers on the TSTT network. Your roaming charges will be different. TSTT has revised its post-paid mpower plans. The new plans will be effective from 1st August 2004. All prices are in TT dollars and are VAT inclusive. The following table is based on an official TSTT advertisment (Trinidad Guardian Wednesday 30th June page 6 and Express Wednesday 30th June page 47). What are the rates for pre-paid GSM service? Peak rate: TT$1.99 per minute. Off-peak rate: TT$0.99 per minute. Sunday rate: TT$0.65 per minute. To send TSTT Lingo (SMS) messages: TT$0.35 per message. TSTT has revised the rates for its mpower pre-paid GSM service. The new rates will be effective from 1st August 2004. All prices are in TT dollars and are VAT inclusive. The following information is based on an official TSTT advertisment (Trinidad Guardian Wednesday 30th June page 6 and Express Wednesday 30th June page 47). Off peak: TT$0.79 per minute. Off peak: TT$0.69 per minute. Saturdays and holidays: TT$0.69 per minute. Lingo: 50 “free” per month. This table is based on an official TSTT advertisment: Trinidad Guardian Monday 24th May 2004 page 22. Information in this section is based on an official TSTT advertisment in Newsday Wednesday 30th June 2004 page 20. Preliminary reports from users of the trial service indicate that access speeds are similar to those of dial-up Internet access via regular land-lines. Introductory rates are valid from 22nd July 2004 to 31st August 2004. Users who sign for these special rates will pay them until 31st March 2005. Users will have to pay regular rates from 1st April 2005. REGULAR mzone rates (see following table) will be effective from 1st September 2004. Will existing (TDMA) cellular phones continue to work now that TSTT operates a GSM service? Can my “foreign” GSM phone work here? What models/brands of GSM phones will work on TSTT’s GSM system? Will TSTT provide their own SIMs for the GSM phones? Can my (USA/Canada/European/Asian/”foreign”) GSM cellular phone work on the TSTT GSM system? area where you normally use your phone. The roaming agreement provides for user authentication, billing procedures and service charges. Where (geographic location) you can roam with your phone. For example, if you can roam with your phone in Trinidad and Tobago. If your phone/handset is compatible with those foreign systems. Which network and/or card-enabled features will be available to you while you roam. The billing procedures for roaming. If the roaming is “seamless” or “unregistered”. See the FAQ (Frequently Asked Questions) section for more information about roaming. What models/brands of cellular phones will work on TSTT’s GSM system? purchasing that “used”/”pre-owned” phone. If you decide to switch from TDMA to GSM, there are a variety (in terms of features and cost) of GSM phones available from the popular brands e.g. Motorola and Nokia. At the present time GSM handsets and service plans are more expensive than TDMA handsets and service plans in Trinidad and Tobago. Further details about the Nokia phones on this list can be found at the official Nokia website: http://www.nokiausa.com/. As always, contact TSTT for further information on cost, availability, different brands of phones, etc. Will TSTT provide Subscriber Identity Modules (SIMs) for the GSM phones? TSTT will provide Subscriber Identity Modules (SIMs) (See: What are SIMs?) for the phones that are bundled with its various GSM service plans. In general, SIMs will be issued with the purchase of a handset. You will be able to purchase additional SIMs without having to purchase a handset. SIM configuration: TSTT will provide the SIM configuration in order to identify TSTT specific customers as well as enable various services for the local network. See the What models/brands of cellular phones will work on TSTT’s GSM system? section for a list of GSM phones being provided by TSTT. TSTT has stated that it cannot activate a foreign SIM card. TSTT has stated that its GSM services cannot be activated on SIMs from a foreign provider. Handsets sold by TSTT will be “SIM-locked” and therefore will only work with TSTT SIMs. If you have a (new/used) GSM phone from (USA/Canada/Europe/Asia/”foreign”) and it is “SIM-locked” to a foreign operator’s network, that phone/handset will not work with TSTT SIM cards. See: What are SIMs? and What is “SIM lock”?. Note to visitors from (USA/Canada/Europe/Asia/”foreign”): The SIM provided by YOUR network operator will continue to work in YOUR phone when you roam in Trinidad and Tobago. However, if your phone is “SIM-locked”, you will not be able to use a TSTT SIM card in that phone. The creator(s) of this page cannot provide any sort of help/instructions on how to unlock “SIM-locked” or any other sort of “locked” GSM phones! Do not ask for such instructions. The creator(s) of this page cannot provide any sort of help/instructions on how to unlock “locked” TDMA phones! It must be able to operate on the 1800MHz (1.8GHz) frequency. It must not be “SIM-locked” to a foreign operator’s network. If the phone/handset is locked, it will not work with TSTT SIM cards. See: What are SIMs? and What is “SIM lock”?. Do not purchase SIMs from outside of Trinidad and Tobago for use on the TSTT GSM network. See: Activating non-TSTT SIMs. If you travel frequently and wish to roam with your GSM phone then you may want to purchase a tri-band phone. See the FAQ (Frequently Asked Questions) section for more information about tri-band phones. If you wish to use the GSM data services (e.g. GPRS), make sure the particular phone model has that capability. Know what you are purchasing! Less expensive GSM phones tend to be limited to voice and text messaging and do not have data capability. SIM-locked phones restrict you to a particular cellular network. Lock-free phones (that is, phones which are not SIM-locked at the factory) allow you to use any SIM from any GSM provider anywhere in the world. Dual band refers to the ability of GSM network infrastructure and phones to operate across two frequency bands. For example at 900MHz and at 1800MHz. What is a tri-band phone? A tri-band cellular phone has the ability to operate on the 3 different frequencies (depending on location) commonly used by GSM operators. These GSM frequencies are: 900MHz, 1800MHz and 1900MHz. What is a dual mode phone? A dual mode cellular phone has the ability to operate in either analog or digital mode depending on network conditions. This description is exclusive to TDMA phones since the GSM system is one hundred percent digital. TSTT has discontinued analog TDMA service. Can my existing (TDMA) cellular phone work on the TSTT GSM system? No, because TDMA cellular phones are incompatible with the GSM system. GPRS is the GSM Packet Radio Service. Packet switching utilises the network only when there is data to be sent as opposed to sending a continuous stream of data over a permanent connection. Users are able to send and receive data at speeds of up to (a theoretical maximum) of 115Kbit/s. GPRS enables users to connect to a wide range of public and private data networks which use standard data protocols such as TCP/IP and make use of applications such as email or Internet (WWW) access. Subscriber Identity Module (SIM) cards are used to provide individual identities for each mobile user: e.g. authentication and storage for user data and network configuration information. The current generation of SIMs (“Smart” cards) contain microchips which extend the “intelligence” and capability of the card. Users are now able to access a vast range of card-enabled (as opposed to network-enabled) applications. The SIM must be inserted in the phone for the user to make and receive calls. “SIM lock” is the term used to describe the pre-programming of handsets by manufacturers to ensure that the handsets will only work with SIMs issued by a specific GSM network operator. For example: TSTT has stated that it will be selling SIM-locked phones. This means that if you try to use a non-TSTT SIM, the phone will not work. National Roaming: The visited network is in the same country as the home network. International Roaming or Global Roaming: The visited network is outside the home country. Inter-standard roaming: The visited network operates on a different technical standard than the home network. Seamless roaming allows cellular customers to make and receive calls on “visited” networks, as long as there is a roaming agreement between the operator of the “visited” network and the operator of their “home” network. Unregistered roaming allows cellular customers to make (originate) calls on “visited” networks where there are NO roaming agreements between the operator of the “visited” network and the operator of their “home” network. Calls are billed via one of these methods: Collect, Credit Card or Calling Card. Calls which originate via unregistered roaming are usually more expensive than calls which originate via seamless roaming. TSTT does not officially support unregistered roaming at this time (July 2004). Where did you get all of this information? Do you work for TSTT? The creator(s) of this page and the TTCS are not affiliated with Telecommunications Services of Trinidad and Tobago (TSTT). All information on this page was gathered from public sources. No one invoved in the creation and maintainence of this page is employed by TSTT. How long has this GSM page been online? This GSM page has been online since 20 October 2002. How do I contact TSTT for more information? At any TSTT Customer Service Centre. Via telephone number: 824-TSTT (8788). You can also check the local telephone directory for general information about TSTT Mobile Services and contact information. The creator(s) of this page cannot provide any sort of help/instructions on how to unlock “SIM-locked” or any other sort of “locked” GSM or TDMA cellular phones! DISCLAIMER: The creator(s) of this page and the TTCS are not affiliated with Telecommunications Services of Trinidad and Tobago (TSTT). This page has not been endorsed in any way by TSTT. Information on this page is subject to change without further notice. If you use any information from this page, you do so at your own discretion and risk and you are solely responsible for any and all: financial loss, damage to your equipment or loss of data that may result directly or indirectly from such use. In other words, if you screw-up, or your equipment or data gets screwed up, it is 100% YOUR fault! Don’t blame anyone else. SMS or Short Message Service, (also known as short messaging service, text messaging, mobile messaging, or alphanumeric paging, celltext, texting, phone messaging) enables you to send brief text/numeric messages to and from digital cellular telephones. Messages can originate from cell phones as well as e-mail addresses and public SMS gateways on the Internet. Telecommunications Services of Trinidad and Tobago (TSTT) is offering the service under the brand name “TSTT Lingo”. The Trinidad and Tobago Computer Society (TTCS) is unable to answer questions about services, cellphones, etc offered/available in other countries. Messages can be received while making voice calls, there are no busy signals to contend with, it is silent and discreet (unless you have one of the many annoying alert tones enabled!). Messages generated by SMS are delivered immediately and directly to your phone, there is no need to call an access number or enter/remember a password to retrieve it (as must be done with voice-mail). In Trinidad and Tobago, users of the pre-paid services (both “Liberty” for the TDMA and pre-paid Mpower GSM) have found that brief messages sent via SMS are cheaper than making a voice calls to “send” the same information. SMS messages are sent to and processed by a Short Message Service Centre, which then delivers the message to the recipient’s phone. If the phone is turned off, the service centre will store the message and attempt to re-deliver it for a period of 3 to 7 days. The actual time is dependant upon the service provider (TSTT). What is the difference between SMS, Instant Messaging Service (IMS), and E-mail? E-mail and SMS are both “store and forward” systems that utilize a “gateway” to pass messages from senders to recipients, however, the obvious difference between the two are the length/complexity of the messages that can be sent on the respective systems. The maximim size of a SMS message is usually 160 characters (actual size is dependant on the service provider). The messages are limited to text and numeral characters. Graphics, colour, HTML formatting and file attachments are not allowed. On the other hand, e-mail can contain thousands of characters and allows the use of HTML formatting, files to be attached and images to be embedded within the message . Instant Messaging Service (IMS), (e.g. AOL Instant Messenger “AIM”, ICQ, MSN Messenger and Yahoo Messenger) allows you to conduct real-time text conversations (“chat”) with people who are simultaneously connected to the Internet and, in some cases, allow the transfer of files. SMS messages are immediate, but not simultaneous. How do you send and receive SMS messages? Receiving messages is easy. Most phones will display an incoming message alert graphic on the screen. You may also set a tone to sound when incoming messages are received. Once a message is received, you can use the scroll keys on your phone to view the content of the message. Options to store, reply, or forward each message will be available at that time. The exact procedure to send a message varies from device to device, but it usually involves entering the recipient’s phone number or e-mail address, and then composing the message with the phone keypad. You may have the option to send the message instantly or store it for later delivery. Check the user’s manual for the specific details on how to access these features on your particular brand/model of cell phone. How do you use public gateways to send messages? Update: According to a news report (Sunday Guardian: 14th December 2003 page 3 and Sunday Newsday: 14th December 2003 page 8) TSTT will begin to charge for receiving SMS messages sent from the Internet in April 2004. How will this affect the public SMS gateways? We do not know but most likely they will have to shut down. Update 2: May 2004: TSTT has not implemented any charges for receiving SMS messages sent from the Internet at this time. What are the fees for the TSTT Short Message Service? There are NO activation fees. There are NO charges/fees for receiving messages. There are NO charges/fees for sending messages via Internet email to a cellphone. There are NO charges/fees for receiving messages sent via Internet email to a cellphone. There are NO charges/fees for sending messages via a public SMS gateway to a cellphone. There are NO charges/fees for receiving messages sent from a public SMS gateway to a cellphone. Sending messages from a “Connect” (post-paid TDMA) cellphone costs TT 35 cents (VAT inclusive) per message. Sending messages from a “Liberty” (pre-paid TDMA) cellphone costs TT 50 cents (VAT inclusive) per message. Sending messages from a “Mpower” (post-paid and pre-paid GSM) cellphone costs TT 35 cents (VAT inclusive) per message. Update: According to a news report (Sunday Guardian: 14th December 2003 page 3 and Sunday Newsday: 14th December 2003 page 8) TSTT will begin to charge for receiving SMS messages sent from the Internet in April 2004. Actual prices have not been released. The charge for receiving SMS messages sent from the Internet will be applicable only when the sender “is not an Internet or mobile customer using TSTT’s network”. TSTT has implemented a commercial/pay “SMS Content service”. See this section: Commercial SMS Services for further details. The TSTT SMS content service was launched on Monay 24th May 2004. It is being marketed under the brand “TSTT Lingo Info Text”. News: every morning: TT 40 cents per message for Liberty and Mpower (pre-paid and post-paid) customers. Sports: once a day (Monday to Friday): TT 40 cents per message for Liberty and Mpower (pre-paid and post-paid) customers. Scriptures: every morning: TT 40 cents per message for Liberty and Mpower (pre-paid and post-paid) customers. Stock: as traded: TT 80 cents per message for Liberty and Mpower (pre-paid and post-paid) customers. Movie schedules: on demand (will be more than one message): TT 20 cents per message for Liberty and Mpower (pre-paid and post-paid) customers. Lotto: twice a week (Wednesday and Saturday): TT 30 cents per message for Liberty and Mpower (pre-paid and post-paid) customers. Play Whe: twice a day: Monday to Saturday. Pick 2: twice a day: Monday to Saturday. Cash Pot: once a day: Monday to Saturday. “Connect” customers (TDMA post-paid) pay a flat fee of TT$29 per month (ALL services included). Send a text message to 683-9999 with the words START ‘service name’. e.g. START NEWS is the text to send to 683-9999 if you want messages about the news. A confirmation text will be sent to phone being used to subscribe to the service. Users can subscribe to as many services as they desire. Send a text message to 683-9999 with the words STOP ‘service name’. e.g. STOP NEWS is the text to send to 683-9999 if you want stop messages about the news. A confirmation text will be sent to phone being used to UN-subscribe from the service. Users can RE-subscribe to the service whenever they desire. To send a Short Message using your cellular telephone, the message must be addressed to: 868####### (where ####### = the cell number of the person receiving the message). The exact procedure to send a message from one cell phone to another cell phone varies from device to device, but it usually involves entering the recipient’s phone number and then composing the message with the phone keypad. Check the user’s manual for the specific details on how to access these features on your particular brand/model of cell phone. Check your retailer to make sure your new phone supports sms before purchasing it! If your phone model/manufacturer is not listed here, check your user’s manual to make sure it supports these features. All sms options supported by these units may not be available on the TSTT system. Contact TSTT at: 824-TSTT(8788) if you require more information on the features, availability, restrictions, requirements, fees, etc associated with this service. Maximum size of the message: 160 characters (punctuation marks AND spaces are counted as characters). Messages have to be in plain text. SMS does not support HTML formatting. In other words, it won’t look like a web page and you can’t see colours, graphics or those email “wallpapers”. Outlook/Outlook Express users take note! You may have to check your software settings/options/configuration and switch off HTML formatting. You cannot send any sort of file attachments e.g. zip, mp3, mpeg, mpg, avi, doc, xls on the SMS system. Turn down the volume of your alert tone. YOU need to know you received a message. No one else does. Keep your subject line brief. The characters in the subject count towards your total of 160. Better yet, do not use a subject line that way you can maximise the content of your message. Messages must be read on cell phone screens so keep your message brief. Don’t send a “signature”, a tagline, inspirational quote or any other unnecessary material with your message. Remember, there is a character limit so your message will be truncated if it exceeds that limit. Avoid unnecessary spaces in the message. Spaces count towards your total of 160 characters. SMS supports a limited number of characters per text message (approx. 160) so here’s a list of abbreviations and emoticons to help create that message. DkDon’t know DUR?Do you remember? RAre RMBRing my Bell ROFLRolling On The Floor Laughing ROFLOLRolling On The Floor Laughing Out Loud ROTFLMAORolling On The Floor Laughing My A## Off RU?Are you? RUOK?Are you Ok? No “words” available at this time. Emoticons (also known as “smileys”) are used to convey a facial expression in text messages on mobile phones (SMS). Who can I contact at TSTT for further information?The contact number given in a TSTT advertisment is: 824-TSTT(8788). Can you tell me if brand X, model y is sms capable?If it is not on the list, then no. Read your user’s manual and/or check the manufacturer’s website for further information. Why is there a limit of 160 characters?This is due to the limits of the SMS specification as well as the system in use by the SMS provider. Can my phone be “upgraded” (via hardware or software) to support SMS?If the manufacturer did not include the capability then you either have to live without it or buy a new phone with SMS support. It cannot be upgraded. How do I change the “message received” alert tone for my phone?Check the user’s manual for the specific details on how to access these features on your particular brand/model of cell phone. Why must I change the settings in Outlook/Outlook Express?These email clients send HTML formatted email by default. HTML is the “language” used to create web pages. SMS does not support HTML formatting. So if you want to use these clients to send SMS messages you have to turn off HTML formatting and send it in plain text. I used the SMS gateway site(s) mentioned on this page but my message was not sent or I got an error message. What’s wrong with the gateway?These gateways must interface with TSTT so whenever the TSTT system is down, the gateway sites cannot transfer your message. The operators of the gateway site(s) have no control over the availability or reliability of the TSTT SMS service. Is SMS the same as email?No. Can I send SMS messages from the network in my office?Only if your network has Internet access and only if the system adminstrator allows it. Can I send SMS messages from my TSTT cellphone to a cellphone on a foreign network in another country?No. At this time, you cannot send a SMS message from a cellphone on the TSTT cellular system (either TDMA or GSM) to a cellphone on an overseas (TDMA, GSM or PCS) network. Can I send SMS messages from a cellphone on a TDMA network to a cellphone on a GSM or PCS network?Yes, but only because the networks are operated by the same carrier. In Trinidad and Tobago, TSTT operates both TDMA and GSM networks. Therefore it is possible to send a SMS message from a cellphone on the TDMA network to a cellphone on the GSM network and vice versa. TSTT has a roaming agreement with network operator(s) in the country where you are roaming. You are using a TSTT SIM-card in your phone. You will not be able to send/receive SMS messages if you are using a non-TSTT SIM. The TTCS page about GSM service in Trinidad and Tobago provides a list of coutries where TSTT GSM customers can roam and send/receive SMS messages. , they have to know the number of your cellular telephone! Check this section for details. I don’t want this service . . . Can I switch it off?Once the cellphone provider has switched on the service and your phone is SMS capable, it will automatically receive messages addressed to it. However, (according to an official TSTT advertisment in the Trinidad Guardian newspaper, Thursday 7th March 2002, page 15) TSTT cellular customers can contact TSTT to have the service discontinued. The contact number given in the advertisment is: 824-TSTT(8788). Is there any way to block someone from sending SMS messages to my phone?The only definite way to block messages to your phone is to contact TSTT (at 824-8788) and have the service discontinued, unfortunately, this would mean all SMS service/features, not just the nuisance messages, would be blocked. Where did you get all of this information? Do you work for TSTT?The creator(s) of this page and the TTCS are not affiliated with Telecommunications Services of Trinidad and Tobago (TSTT). All information on this page was gathered from public sources. No one invoved in the creation and maintainence of this page is employed by TSTT. How long has this SMS page been online?This SMS page has been online ever since TSTT started testing the service in the last quarter of 2001. Why can’t I receive messages? Is your phone capable of receiving SMS? Some older phones cannot receive sms. Check your users manual. Was it sent properly? review the send messages via SMS section and SMS message specifications to make sure. Did the sender include some sort of attachment or HTML formatting that could “confuse” the SMS gateway? Is it a used phone? Did the previous owner have the service switched off? Why is the message cut off half way through the text?Why did I receive only part of the message? This will happen if the sender did not restrict the message to 160 characters! Is your phone capable of sending messages? Some older phones cannot transmit sms. Check your users manual. Was it formatted properly? review the send messages via SMS and SMS message specifications to make sure. hhttps://www.ttcs.tt/2002/07/17/about-ringtones-17-07-2002/ TTCS page about (Nokia) ringtones. https://www.ttcs.tt/2004/07/05/gsm-in-tnt-05-jul-2004/ TTCS page about GSM service in Trinidad and Tobago. http://www.tstt.co.tt Homepage for TSTT cellular services. We can only answer questions involving services in Trinidad and Tobago. The creator(s) of this page and the TTCS are not affiliated with TSTT. This page has not been endorsed in any way by TSTT. Information on this page is subject to change without further notice. If you use any information from this page, you do so at your own discretion and risk and you are soley responsible for any and all: financial loss, damage to your equipment or loss of data that may result directly or indirectly from such use. In other words, if you screw-up, or your equipment or data gets screwed up, it is 100% YOUR fault! Don’t blame anyone else.